Although humorous in intent, the sentiment featured on Agree with Me by Dimensions sums up how we all feel at times! This counted cross stitch design will definitely be a conversation piece. Finished size: 7" x 5". Designed by Judy Shelby. © Classic Collections Fine Art, Ltd., 2012. This counted cross stitch kit contains: presorted thread, 14 count ivory Aida, needle, instructions.. Autumn Montage is a counted cross stitch design by Janet Stever. Cool air, apples on the trees, pumpkins in the garden. These are all signs autumn is on its way. 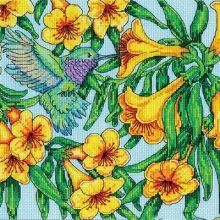 Contains: 14- Count Aida fabric, 6 strand carded 100% cotton floss, needle, graph, instructions. Size 11" x 14" Made in the USA .. Birds on Ferns by Dimensions makes a wonderful display for spring and summer. This stamped cross stitch design features a softly shaded printed background that enhances the stitching beautifully. Size: 12" x 9". Designed by Susan Winget. © Susan Winget. Stamped cross stitch kit contains: • Presorted cotton thread • Printed white fabric • Needle • Easy instructions.. Counted Cross Stitch Kit with Chart, Embroidery Fabric: 100% cotton, Yarn: 100% cotton DMC, 10,5 threads (5,2 stitches)/cm - 27 count, Yarn organizer, Instruction in eight languages, Large-square charted design, Needle, Frontsheet picture, ca. 36 x 26 cm / 14.4" x 10.4", Age category: from 15 years, Stitches: french knot, cross stitch, long stitch, back stitch..
A profusion of colorful butterflies and blooms comprise this exquisite counted cross stitch design. Kit contains cotton thread, metallic thread, 14 count ivory Aida, color-coded thread sorter, needle, and easy instructions. Finished size: 10" x 16" (25 x 41 cm) Designer Info: Punch Studio..
Butterflies--so delicate, so exquisite--who can resist their beauty? Kit includes 18 count ivory Aida, cotton thread, needle, and instructions. Kit contains cotton thread, 18 count ivory Aida, needle, and easy instructions. Finished Size: 8" x 4" (20 x 10 cm). Designer: Laura Regan..